My research focuses on three areas that are key to understanding why animals behave the way they do: (1) investigating interactions between individual physiology and behavior in social species; (2) understanding how these connections may shift under biotic (i.e., group composition, parasitism) and abiotic (i.e., habitat loss, climate change) pressures; and (3) developing tools and techniques to test these lab-based findings under realistic field conditions. 1. How are individual physiology and behavior connected in social species? Respirometry chamber for social species. The “calming effect” is a theory that states that individuals may be able to reduce overall energetic demand through group living. through cost-sharing of defense with fellow members of the group. However, little empirical evidence exists to support this theory. I conducted the first study to successfully capture the “calming effect” of group living in individuals from a gregarious species, using aerobic metabolic rate as an indicator of stress (Nadler et al., 2016 Journal of Experimental Biology). In order to measure metabolic rate of individuals while simulating realistic shoaling conditions, I engineered novel equipment for use with traditional respirometry techniques. I found that individuals in groups exhibit a 25% lower aerobic metabolism (and hence energy expenditure) than isolated individuals. Any increase in energetic needs will come at the expense of fitness-enhancing processes like reproduction, so could have profound consequences in social species. I plan to further investigate this topic in the future, in order to better understand the factors (e.g., group composition, species, geographic region, habitat type) that modulate this acute “calming effect” on metabolism. My ongoing work also investigates how the individual physiology of group members influences the group’s overall phenotype. Focusing primarily on morphological characteristics, many studies have illustrated the negative impact that heterogeneity in phenotypes (known as the “oddity effect”) can have on defensive behavior and locomotive efficiency in animal groups. Using three-dimensional video recording techniques, I measure how individual physiology and swimming capacity influence the cohesion and coordination of groups in motion. I hypothesize that groups composed of more homogenous physiological phenotypes will exhibit more effective swimming behavior, as diversity in maximum aerobic capacity and swimming abilities may lead to diverging prioritization of processes like foraging versus defense. ​swimming at 15, 30, 45 and 60 cm/s in a swim tunnel. For my postdoctoral training, I was interested in understanding the role that neurophysiology plays in behavioral phenotypes. My interest in this field was piqued by my work with the fast-start escape responses of shoaling fish. This behavior is modulated by anaerobic swimming performance, sensory stimuli, and neural control, and is typically mediated by a pair of higher order command neurons called Mauthner cells. My work was the first to show that group composition can mediate a defensive behavior that was previously thought to be hard-wired in the brain. Shoals composed of familiar fish reacted 10 times faster to a threat stimulus and exhibited a 50% faster motor output than shoals composed of unfamiliar fish (Nadler et al., in prep). I will be working with neurophysiologist Dr. Øyvind Øverli (Norwegian University of Life Sciences) to investigate how social context influences Mauthner-cell reactivity and individual neurochemistry. Video of fast-start escape response of a fish school (filmed at 30 fps). The same response filmed in high speed (240 fps). 2. How do these connections shift under biotic and abiotic pressures? My past and current research focuses on better understanding how projected climate change (in terms of rising sea-surface temperatures, ocean acidification, and hypoxia) may shift the links between behavior and physiology in social species. To examine these ideas, I collected wild coral reef fishes and acclimated them to projected future conditions in the laboratory and tested how it impacts the “calming effect”, fast-start escape response, and the group’s swimming performance. Coral reef fishes present an ideal model system to test these questions, as these fishes are accustomed to limited variation in habitat conditions and therefore may be more susceptible to changes to their environment in the future than other habitat types. Social behavior is also an integral part of the ecology of many coral reef fishes. Therefore, any factors that alter the tradeoffs of sociality may drastically impact coral reef fish assemblages. While this work is ongoing, I published the first of these results in 2016 (Nadler et al., 2016 Conservation Physiology), where I found that the “calming effect” described above is maintained under projected future ocean acidification. This was a novel finding because it contradicted the common perception that the behavior of marine fish is universally retarded at elevated CO2 conditions. Collecting fish on a reef using a barrier net (video credit: Shaun Killen). ​Another major global disturbance on coral reefs related to climate change is coral bleaching and habitat degradation, which recent work suggests can suppress essential sensory abilities that help fishes detect threats in their environment. In an ongoing collaboration with Professor Mark I. McCormick (James Cook University), I am investigating how these effects influence the physiology and behavior of social fishes on coral reefs, particularly related to responses to threats. Lizard Island, Northern Great Barrier Reef, Australia. Parasites are also another major stressor that animals must deal with. Infection status is known to alter the physiology and behavior of many species, and yet is largely disregarded as a major factor in ecological processes. My current work is using a ​brain-encysting, behavior-modifying parasite (Euhaplorchis californiensis) found in the in the shoaling California killifish Fundulus parvipinnis as a model system. This ongoing work, in collaboration with Professor Ryan Hechinger (Scripps Institution of Oceanography), examines how infection influences social behavior, individual physiology, predator-prey interactions, and fast-start performance in a range of contexts and throughout ontogeny in different host species. ​the California killifish Fundulus parvipinnis. The brain of a California killifish infected with E. californiensis. Each of the small dots visible on the brain are individual parasites. Killifish have been found to harbor as many as 5000 individual parasites (known as metacercariae, the encysted larval phase of this parasite). 3. How can we test these questions under realistic field conditions? One area of social behavior that remains largely unknown is fission-fusion dynamics. Fission-fusion dynamics investigate the factors that promote or suppress fidelity to a single social group. For instance, as described above, familiarity with group-mates can greatly increase the effectiveness of defensive behaviors, and hence would promote group fidelity. In contrast, if food was a limiting factor, competition for valuable food resources would suppress group fidelity. Using a coral-dwelling damselfish species as a model, I began investigating this topic using a mark-recapture study. One challenge when tagging small, athletic fishes is the difficulty in finding a tagging system that won’t hinder their swimming abilities and hence confound your results. For this study, I adapted a technique typically used in lab studies called visible implant elastomer (VIE), which allows the researcher to administer unique combinations of color sequences just under the dermis, to make the individual uniquely identifiable. In order to avoid disturbing my fish’s natural behavior, I developed a VIE system that could be administered in the field on SCUBA. This work suggested that while 64% of individuals choose to maintain association with a single shoal, others choose to migrate as much as hundreds of meters, seemingly without regard to the habitat characteristics. My future work will aim to tease apart the tipping point that would promote migration to a new social group. ​elastomer (VIE; photo credit: Amy Cox). While we know that groups composed of similar morphological phenotypes maximize the benefits of social behavior, the composition of physiological and behavioral phenotypes within wild social animal groups remains a major knowledge gap in the literature. My frequent collaborator, Dr. Shaun Killen (University of Glasgow), and I contributed to a special issue of Philosophical Transactions of the Royal Society B (Killen et al. 2017), where we summarized the current evidence supporting physiological sorting patterns in wild social animal groups, and where the field should move into the future. I started the process of unraveling these ideas by collecting wild shoals of fish and classifying their metabolic phenotype. I found that individuals non-randomly associated with conspecifics of a similar metabolic phenotype (Nadler et al., in review Marine Biology). This work is also becoming more field-focused with devlopments in stereo-camera technology. A stereo-camera is a type of camera with two or more lenses with a separate image sensor or film frame for each lens. This allows the camera to simulate human binocular vision, and therefore gives it the ability to capture three-dimensional images or video. While in the past this technology has been prohibitively expensive, in recent years, smaller cameras with waterproof housings have been developed. My current work is developing ways to measure school swimming behavior and escape performance using this technology. Heading out to the reef to collect fish for lab-based experiments (photo credit: Shaun Killen). 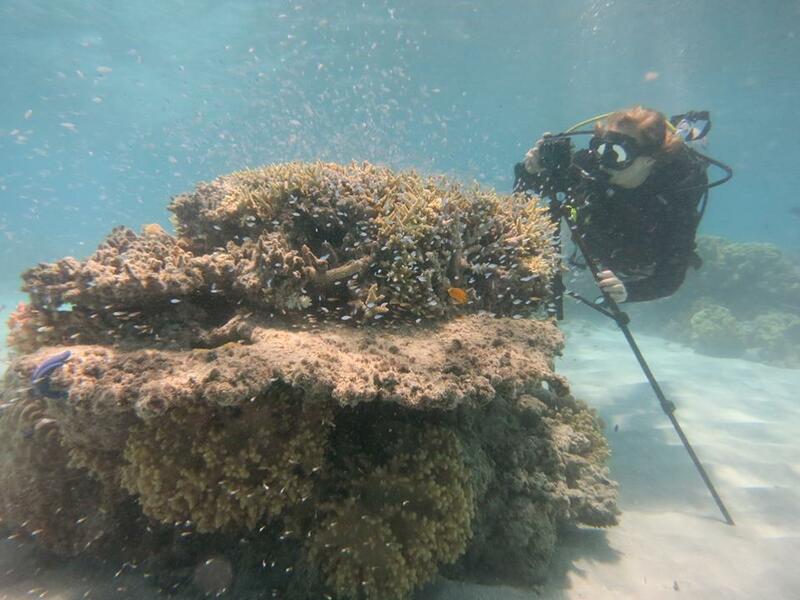 Recording schools of the damselfish Chromis viridis using a 3D stereocamera at Lizard Island (photo credit: Eva McClure). A great blue heron foraging on a shoal of California killifish in a mesocosm at Kendall-Frost Marsh Reserve (San Diego, CA, USA). ​killifish´s behavior to make them more conspicuous to their primary predators (marsh birds) as well as potentially making them easier to catch. Using a mesocosm design in natural marsh systems, we are assessing how infection alters foraging success by marsh birds on infected and uninfected killifish.